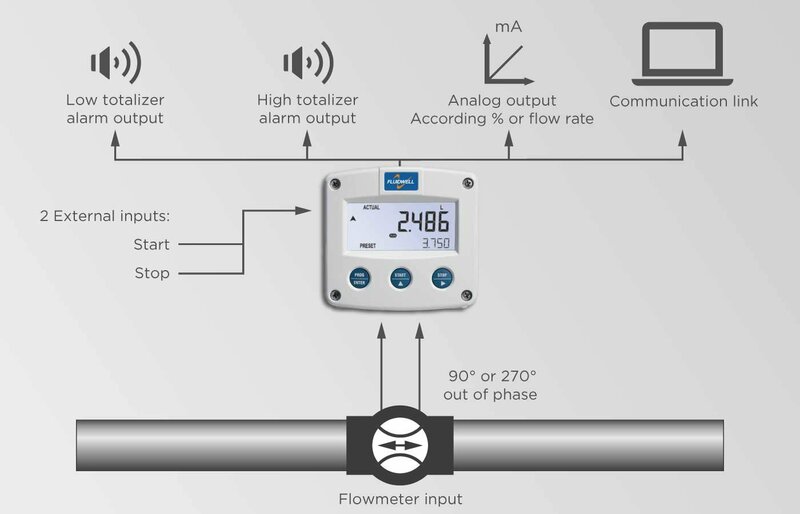 The F117 has been developed for applications where the totalized quantity has to be monitored and not the flow rate. When a start command is given, the totalizer is reset to zero. The amount of product measured from that moment is monitored continously for high totalizer values. Monitoring for low totalizer values will commence after a stop command is given or after a pre-defined time. The display shows the preset and actual totalized value, percentage and flow rate. The totalizer alarms are clearly indicated and two outputs are available to transmit alarm conditions. The analog output value mirrors the measured quantity in relation to the preset value. For remote control, an external start and stop input is availble as standard. The desired totalized (preset) quantity can be set by the operator. Totalizer monitoring: two alarm values can be set: low and high totalizer alarm. Analog output signal reflecting the totalized value or flow rate. Displays total and preset value or percentage simultaneously. Flow rate: seven 17mm (0.67") digits (shown after stop command). 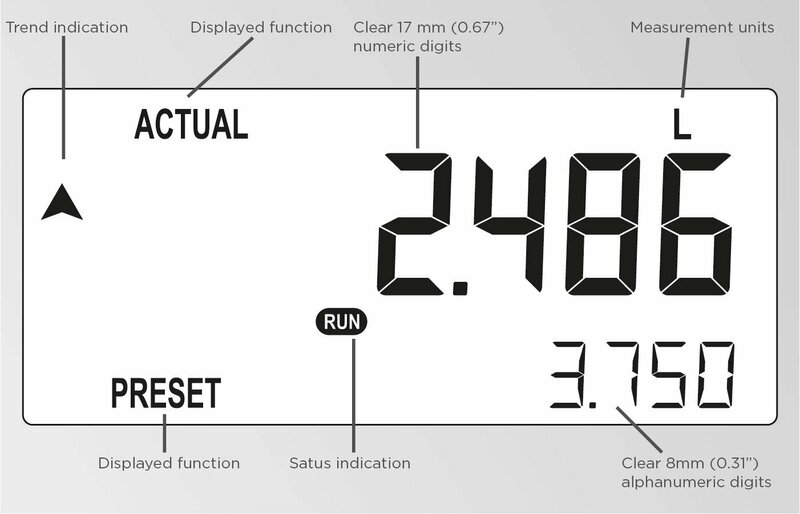 Total - reset after a start-command: seven 17mm (0.67") digits. Automated processes where a minimum and / or a maximum dispensed quantity has to be monitored continuously. Remote control: start (with quadrature input not available). Remote control: start, stop or continuous signal. Function: Two alarm outputs for low and high totalizer alarm. Function: Re-transmitting the flow rate or the totalized quantity in relation to the preset quantity - the output can be scaled to any range (e.g. 0.00 L to 2.50 L).